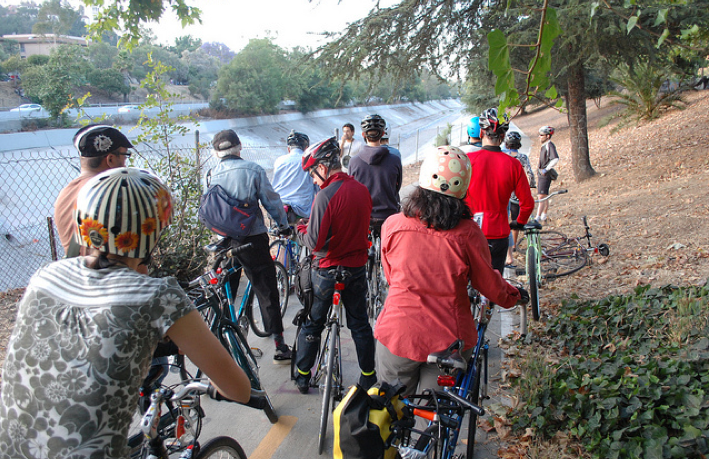 A quick stop on the Arroyo Seco Bike Path at our 2011 Flying Pigeon Fundraiser. Next Friday evening, Streetsblog rides back to the Flying Pigeon Bike Shop, 3404 North Figueroa Street, for a #fig4all ride and party. You’ll also have the chance to talk to the camera about how better bike facilities are needed and wanted in NELA. There’s even a chance Council Member Jose Huizar will be on hand to hear from us. Join us at the Pigeon next Friday. Ride starts at 6:30. Party starts soon afterwards. We’re asking for a $10 donation, but all are welcome regardless of ability to pay. RSVP on Facebook or to damien@streetsblog.org. * Oh, and beer, there will be beer. My bike was recently stolen. Does the flying pigeon offer rentals? Yup. Bike rentals on our shop rides are $20. Any bikes rented for this event and the proceeds go directly to Streetsblog. Don’t Forget, Ride and Party with Streetsblog in NELA.